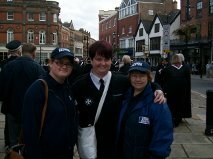 Chesterfield Street Pastors are trained by the St John's Ambulance team to provide first aid to those that need it on a Saturday night in town. They invited us to join in their annual service of thanksgiving and rededication at Derby Cathedral last Sunday. A special celebration this year as it marks 125 years for them. Street pastors never miss an opportunity for a hug! Here seen with Helen, who has served with St John's in Chesterfield at many local events over a number of years. 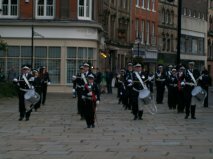 Unfortunately not captured on camera this time but the street pastors were unable to resist the temptation to dance along to the stirring tunes played by the marching band outside the cathedral.